Forsy is a free WordPress theme with a featured posts and theme options page. Forsy is suitable for any niche, especially for movie and entertainment focused websites. 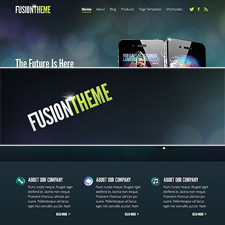 Forsy free theme is another great offering from newwpthemes.com, which is putting out some great free templates for the WordPress community to enjoy. Make sure to check out some of the rest of their work after downloading Forsy free theme from the link below! Logo PSD included in the theme folder. Come back and check out the showcase as we find more sites from around the web using Forsy.